After the release of Sam Raimi’s third Evil Dead adventure, Army Of Darkness, fans clamored for the return of Bruce Campbell’s Ash Williams. It took more than 20 years, but the big chin finally returned last year in the first season of Starz’s Ash Vs. Evil Dead. But there were many false starts along the way before Ash came back to dish out quips and beheadings on premium cable. Screen Rant was granted an early listen to the audio commentary for the Ash Vs. Evil Dead pilot, which features Campbell and Raimi—along with producer Rob Tapert and Sam’s brother and co-writer Ivan—as the Michigan natives reveal what they initially had planned for S-Mart’s oldest stock boy. It would appear the only horror story the brothers Raimi didn’t attempt to tie into the Evil Dead saga was how Army Of Darkness—which could have been a late-August hit in the summer of 1993 in an alternate timeline—was held up by producer Dino De Laurentiis. At the time, De Laurentiis was involved in a legal dispute with Universal over the rights to the character of Hannibal Lecter. (De Laurentiis produced Michael Mann’s Manhunter.) Meanwhile, Sam Raimi needed $3 million to finish Army Of Darkness. But Universal refused to give him the money until De Laurentiis handed over the Lecter—a good lawyer could have used the misspelling of Lecktor to their advantage—rights so the studio could shoot a Silence Of The Lambs sequel. 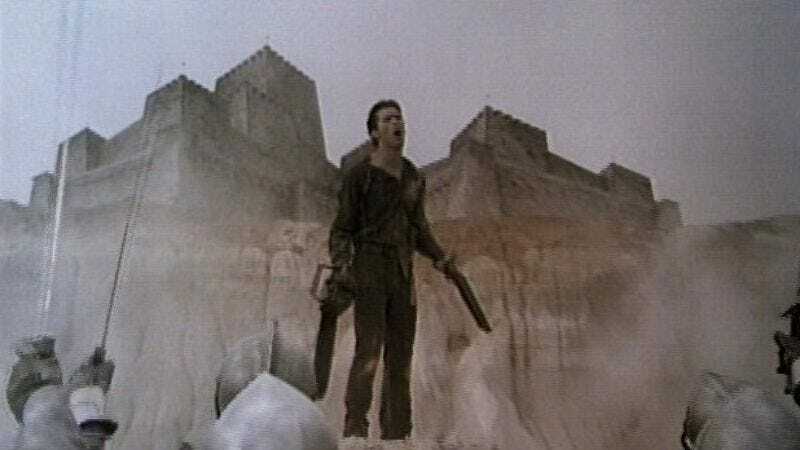 The matter was eventually resolved, but Army Of Darkness was pushed back to the February dumping ground, where the film bombed. Campbell’s career would be put on hold, never starring in another studio picture again. Ash vs. Evil Dead season one comes to DVD and Blu-ray on August 23.